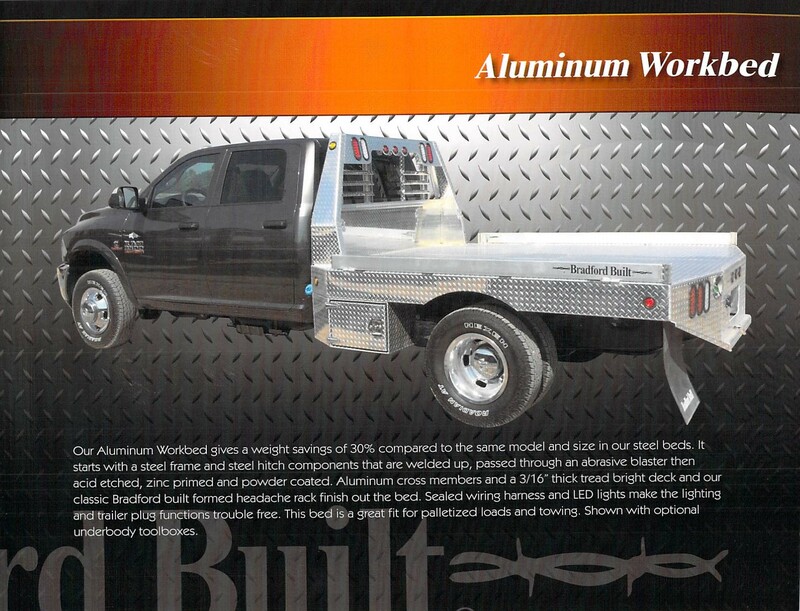 NEW 2019 Bradford Built 102" x 84" Wide Aluminum Workbed. Powder Coated Steel Frame, 4" Flip Down Siderails, Headache Rack with Lights, 30,000 lb. Capacity Recessed Gooseneck Ball and Receiver Hitch. Stake Pockets, Flush Mount Tie Down Rings. Fits on 56" CA Single Rear Wheel Truck with 38" wide frame. NEW 2019 Bradford Built 84" x 84" Wide Aluminum Workbed. Powder Coated Steel Frame, 4" Flip Down Siderails, Headache Rack with Lights, 30,000 lb. 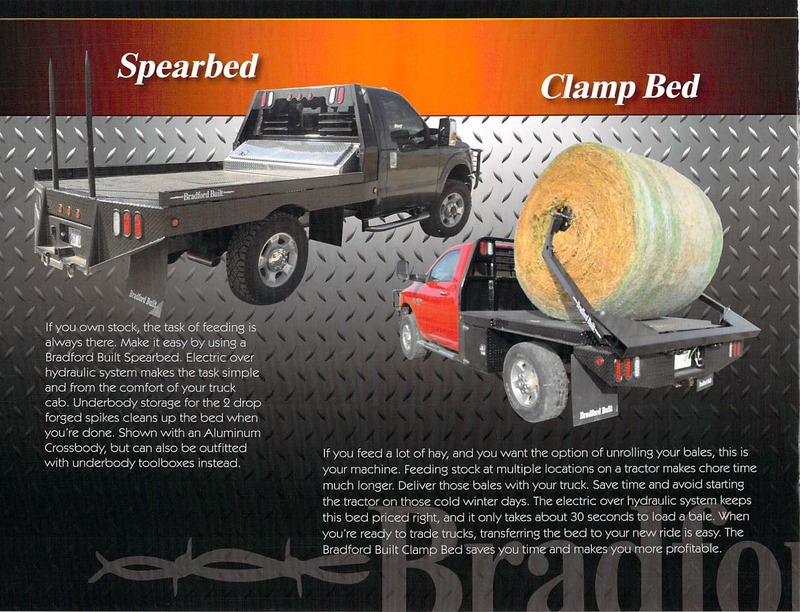 Capacity Recessed Gooseneck Ball and Receiver Hitch. Stake Pockets, Flush Mount Tie Down Rings. Fits on 40" CA Single Rear Wheel Truck with 38" wide frame (Ford). Powder Coated Steel Frame, 4" Flip Down Siderails, Headache Rack with Lights, 30,000 lb. Capacity Recessed Gooseneck Ball and Receiver Hitch. Stake Pockets, Flush Mount Tie Down Rings. Fits on 42" CA Single Rear Wheel Truck with 42" wide frame (Chevrolet). 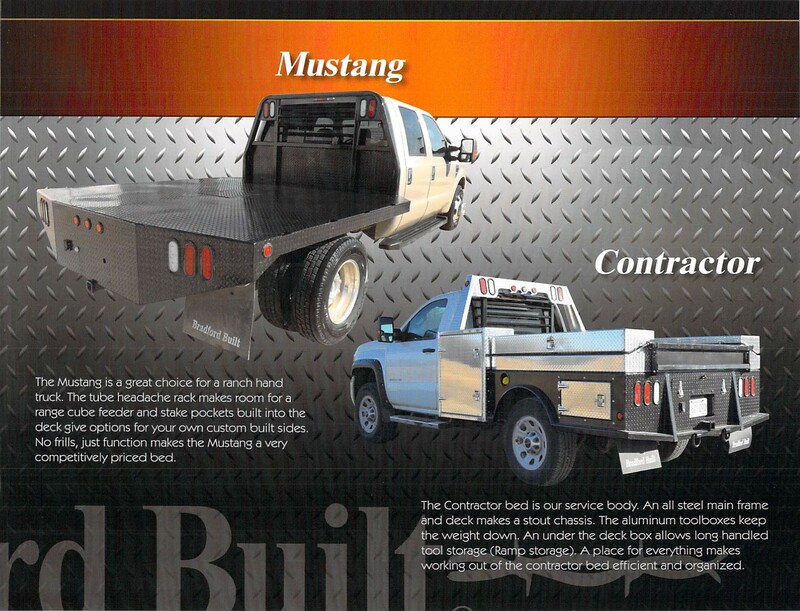 NEW 2019 Bradford Built 84" x 84" Wide Steel Mustang Flatbed. Tube Style Headache Rack with Lights, 30,000 lb. Capacity Recessed Gooseneck Ball and 2" Receiver Hitch. Internal Stake Pockets. 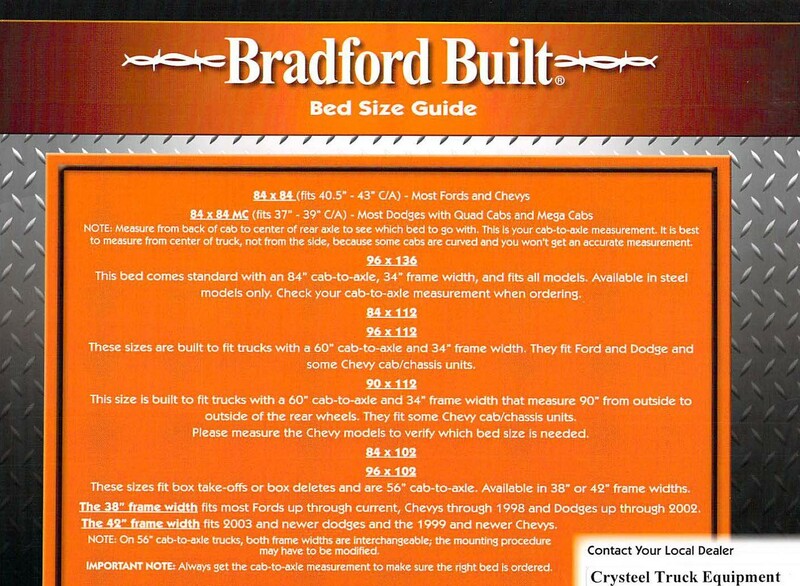 NEW 2019 Bradford Built 112" x 96" Wide Steel Workbed. 4" Flip Down Sides, Headache Rack with Lights, 30,000 lb. Capacity Recessed Gooseneck Ball and Receiver Hitch. Fits on 60" CA Truck with 34" wide frame. 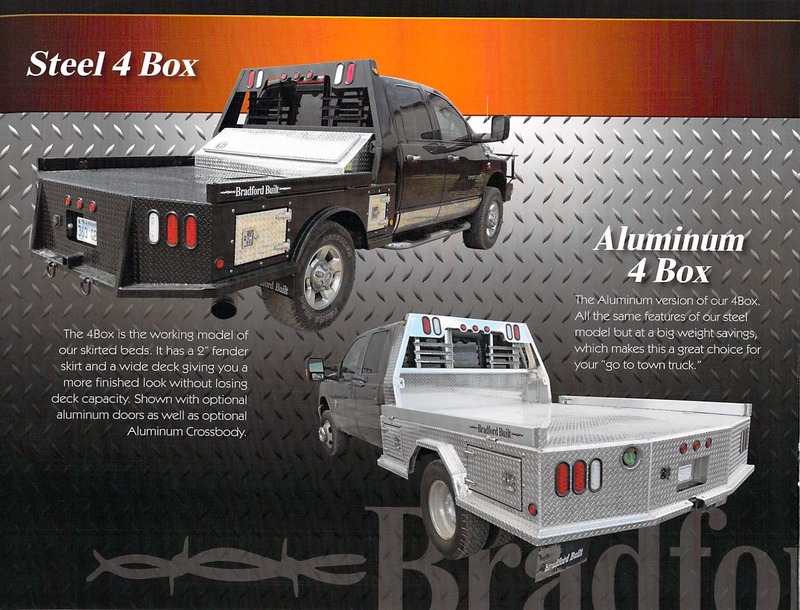 Includes (2) 14" x 14" x 32" Steel Underbody Toolboxes. 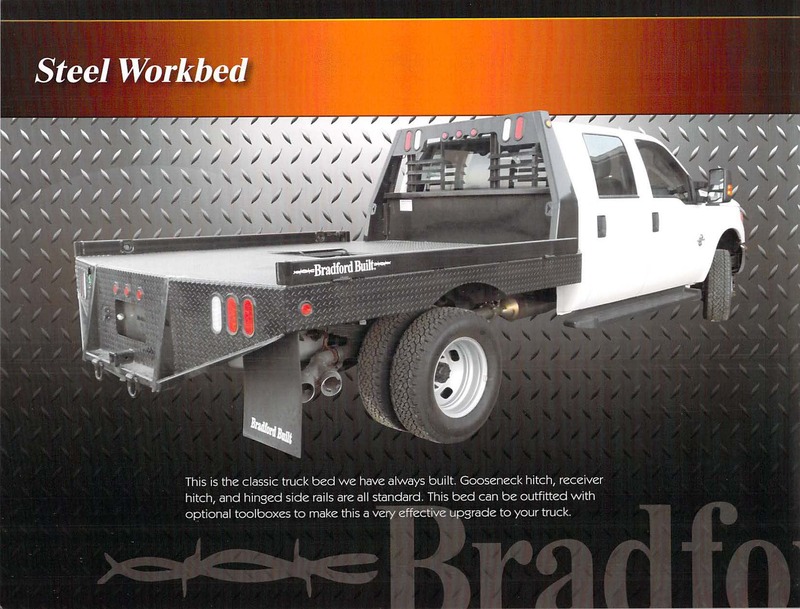 NEW 2019 Bradford Built 112" x 96" Wide Aluminum Workbed. Powder Coated Steel Frame, 4" Flip Down Siderails, Headache Rack with Lights, 30,000 lb. Capacity Recessed Gooseneck Ball and Receiver Hitch. Stake Pockets, Flush Mount Tie Down Rings. Fits on 60" CA Dual Rear Wheel Truck with 34" wide frame. 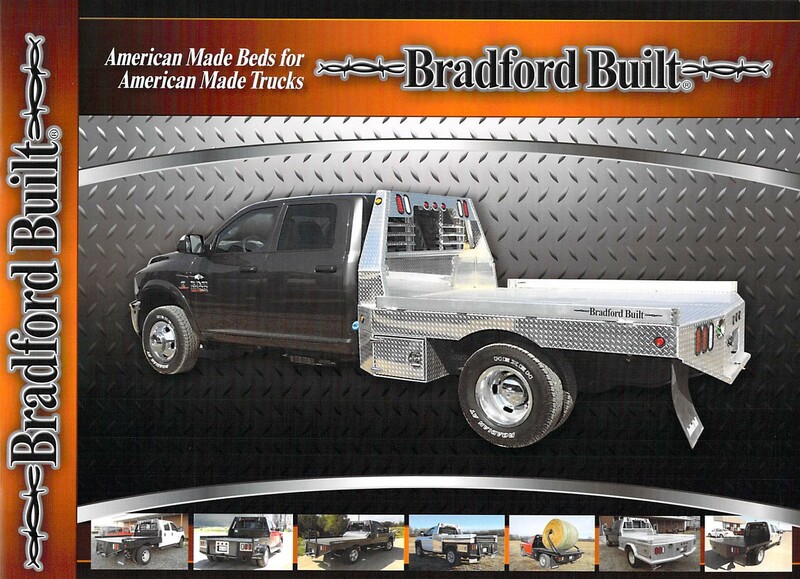 NEW 2019 Bradford Built 112" x 96" Wide Aluminum 4 Box Utility Flatbed. 4" Flip Down Sides, Headache Rack with Lights, 30,000 lb. Capacity Recessed Gooseneck Ball and LED Lights. Fits on 60" CA Truck with 34" wide frame.